1955-1968 primary school, secondary school, high school, apprenticeship as craftsman. 1968-1970 military service 1970-1973 attendance of the FH in Ulm (Germany). 1973 graduation as engineer at the FH in Ulm (Germany). 1973-1978 internee at the Academy of Arts in Stuttgart (Germany), led by Prof. Lehmann. 1978-1979 he freelanced and was a technical consultant for several firms of interior design. Since 1979, George Appeltshauser has been running his own firm of interior design which dedicates to the design of furniture. Appeltshauser has been active in the design of toys, bathroom products, ironware products and technical products made from plastic. He is also active in the setting up of exhibition presentations. 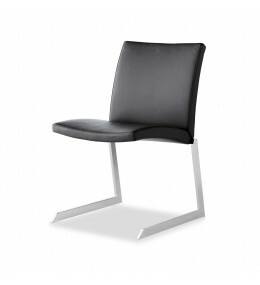 Tulip Chair is a stackable cantilever seat which is linkable with optional writing tablet.